There were two versions that I know of, both Made in the USA. 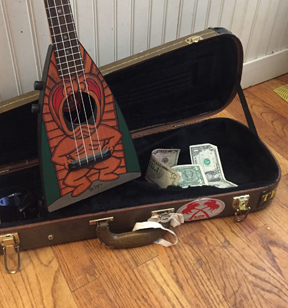 One made by Emenee, which featured Jimmy's face on the headstock and "Emenee", and one by Intersphere, which has the same picture of Jimmy, but has "Hot Cha Cha" on a banner, and the Intersphere logo. Jimmy Durante was a Singer, Musician, Actor and Comedian in Hollywood in the 1920s through the 1970s. He was considered to be one of Americas most loved personalities of the time. He was a star of Vaudeville, Radio, Television, and many Films.